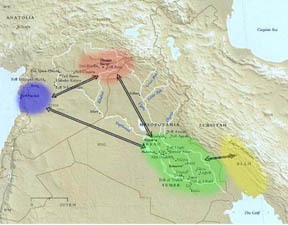 This first map below shows the approximate location of each of the empire's capitol city as discussed on this web site. The actual acreage of each empire but not shown here ebbed and flowed with the political and military events of the times. 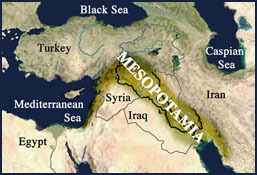 The Sumerians, Akkadians, Babylonians and Assyrians are the main Mesopotamian players. 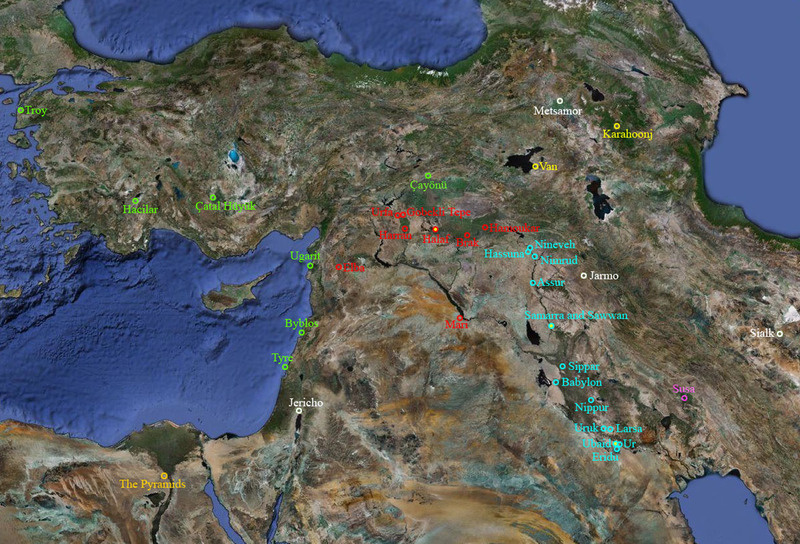 To the north would be the Hittites, Hurrians, Mitanni, Subarians and later the Urartians. To the east would be the Elamites and the southwest the Egyptians. The Lucifer Rebellion was a harbinger of the confusion and discord to be sown among the Nodites. First was the main split between those who chose which side to be on. Then later the rebels fell to quarreling with each other and further fractured into three more smaller groups. If one looks at the four locations you will see that this is where the earliest indications of culture and civilization are located. 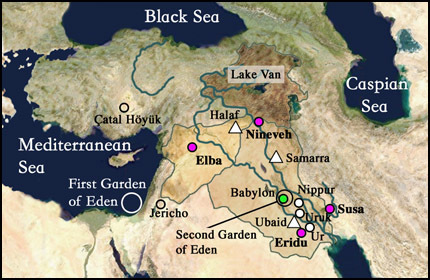 This third map below shows the location of: 3 of the main Sumerian cities (white circles), 3 Pre-Sumerian culture centers (white triangles), 4 cultural areas (pink circles), Babylon and the location of the first and second gardens. 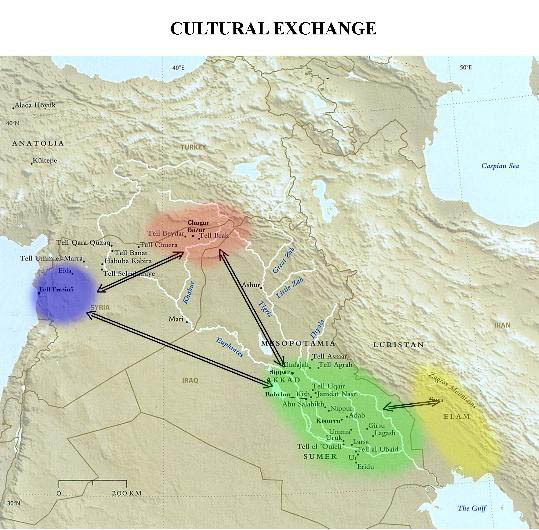 If we look at the four centers we find some of the oldest urban cities. 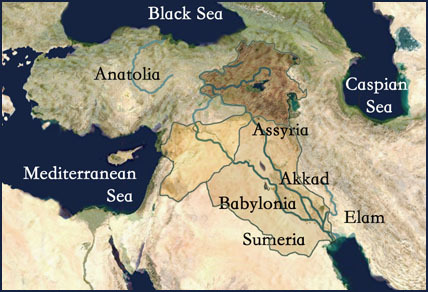 Elba in Syria, Eridu in southern Sumeria, Susa in Elam and Nineveh in northern Mesopotamia. Jericho is also very old, maybe the oldest continuously occupied city but it is not Sumerian. 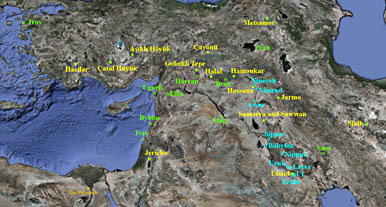 Cuneiform tablets have also been found in Eblaite (a Semitic language from northern Syria), Elamite (from the area of modern Iran), Hittite (an Indo-European language spoken in ancient Turkey), and other languages throughout the ancient Near East. The Semitic invaders also brought in Akkadian and the Babylonian language. "Prehistoric occupation of the site dates back to at least the 6th millennium BC." Nineveh is just across the Tigris from modern day Mosul. "The most southerly and possibly also the earliest city-state of Sumer in southern Mesopotamia. A sounding excavated underneath a ziggurat of the late 3rd millennium BC revealed a sequence of 18 religious buildings. The earliest building was a simple mud-brick shrine resting on virgin sand. By the time of its tenth rebuilding it had acquired the standard form of the Sumerian temple with tripartite plan consisting of a long central room flanked by symmetrically grouped side chambers and was built on a substantial platform. 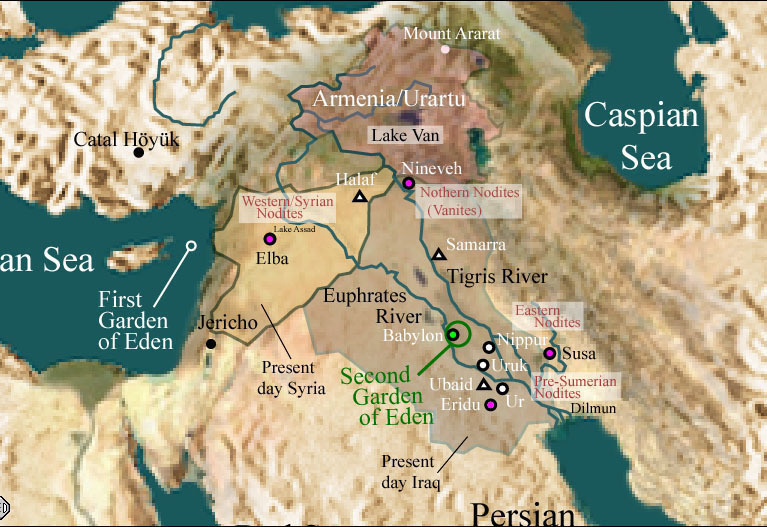 The earliest phase of occupation - named the Eridu Phase - is dated to circa 5000 BC"
"Susa, derived from the word shushan, meaning "lily" in the ancient Semitic tongues, is one of the oldest known settlements of the Mesopotamian civilization, probably founded about 4000 BC. It is frequently mentioned in the Old Testament of the Christian Bible and in the Jewish Tanakh. The Hebrew prophets Daniel and Nehemiah lived in Susa during the Babylonian captivity of the sixth century BC. Esther became queen there and saved the Jews from genocide." "Excavations conclude that the Tell was occupied by its first residents near 3500 BCE." "It is located at Tall Mardikh, this town flourished during the third and second Millennium B.C. the archaeological diggings showed that its royal palace, constructed in the third Millennium B.C. had been burned and destroyed twice many clay tablets, which have been consolidated by fire, have however been discovered there, including one considered as the first bilingual dictionary in the world these tablets use cuneiform script and are written in many languages." To put these dates in some kind of context, Moses in his exodus from Egypt was about c. 1300 B.C. 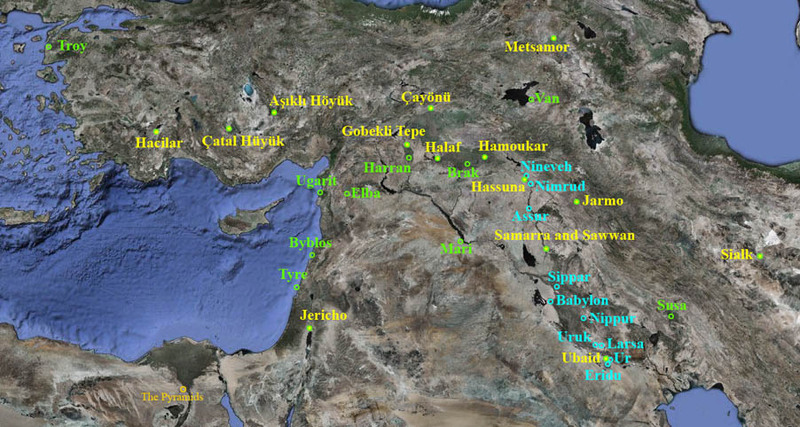 The Old Ones gives more information on these pre-Sumerian cities. Almost all images of these cities and tells are available on the Satellite Images page.